← One Week From Today! We’re partnering with The Little Theatre to bring you some wonderful documentaries for Women’s History Month! Join us every Wednesday for Passionate Representations: Women’s History Month Film Series 2012. The fun starts this Wednesday March 7 at 7pm in Hoyt Auditorium! 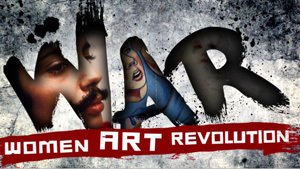 Check out the opening film, “!Women Art Revolution”. The screening is free and open to the public, so bring a friend and spread the word. Curious about the film? “!Women Art Revolution” reveals how the Feminist Art Movement fused free speech and politics into an art that radically transformed the art and culture of our times. The film details major developments in women’s art during the 1970s, including the first feminist art education programs, political organizations and protests, alternative art spaces, publications such as Chrysalis and Heresies, and landmark exhibitions, performances, and installations of public art that changed the entire direction of art. Carrie Brownstein composed an original score to accompany the film. Some of the gifted musicians that contributed to the soundtrack include Laurie Anderson, Sleater-Kinney, The Gossip, and Janis Joplin. Check out our events calendar for a complete list of films with descriptions, and make sure to visit our blog each week for more information. This entry was posted in Community, SBAI Events and tagged #art, #filmseries, #womenshistorymonth. Bookmark the permalink.